Originally published in the Daily Maverick. During a lecture last week, the topic of September 11, 2001 was brought up to make a point about conspiracy-theorists and how frequently they employ confirmation bias to support their views. In short, confirmation bias is the disposition to prefer evidence that supports your existing view, while tending to ignore disconfirming evidence. A student asked me which argument it was that convinced me the conspiracy theories are false. I replied that the world isn’t that simple: there often isn’t one knockdown argument against a position – especially a position involving so many complexities and confounding details. Instead, I said, it’s a matter of the arguments for one position being weaker than the other, when considered in overview. But sometimes the situation is of course more uncertain than this, and it seems impossible to choose sides on particular topic. Yet we often do so anyway, despite the fact that we sometimes can’t support the view we’ve chosen to claim. When last have you heard someone say something like “I don’t know enough about that issue to have a position on it”? Too many of us seem to despise doubt or uncertainty, even if that’s the position best supported by the evidence we have. And with the norm being to have and express a view, the space for being uncertain closes off just that little bit more. I try, for example, to be uncertain about aspects of the climate change debate, but often fail to succeed in doing so. While I don’t know enough about anthropogenic global warming to be convinced of any particular point of view, the emotive fervour of the discussion pushes one to choose sides (and I then choose the orthodox side, simply because that gamble has usually been the correct one on matters of science). Of course, I could do the research – but we don’t have time to research everything that everyone else would like us to be experts on. We need to specialise, and until we do it’s perfectly reasonable to say “I don’t know” – in other words, to be agnostic on any given issue. Of course, for some issues this position might be irresponsible, in that agnosticism might be a moral failing of some sort. For global warming this might well be the case, but seeing as many of us conserve energy already thanks to Eskom’s unreliability in supplying their product and the prices they charge for it, it’s quite easy to be relatively “green”. Many might be flying less in any case thanks to recession, or driving less as a result of petrol prices. The point, in short, is that no matter how hysterical any given person is on this issue, it’s largely not us individuals, but instead corporations and governments, who could do much about the problem (assuming that human activity is part of the problem). But despite being agnostic on this issue, it’s still possible to believe that one side of the argument is superior to the other. Doubt does not remove this possibility, but simply means that you don’t feel justified in claiming certainty. Agnosticism is the absence of conviction, not necessarily the absence of an opinion (whether informed or not). So to say that I am agnostic on climate change does not preclude me from saying that I believe, for example, that Ivo Vegter is wrong in his columns dedicated to refute climate change orthodoxy. If he and I were to have that debate, though, most of what I’d be able to do would be to listen and ask questions when something sounded implausible or needed clarification. Occasionally, I might be able to say “what about this data here”, and he’d no doubt respond with a barrage of counterclaims. To be convinced by the arguments, though, I’d have to study both them and their competition. Until then, it’s largely an entertaining debate rather than an opportunity for conversion to another point of view, because I have the impression (sorry, Ivo) that there is a sufficient number of scholars who are both experts in this field, and engage with it full-time, who disagree with Ivo to make it more likely the case that they are right and he is wrong. But I don’t know, and I also don’t believe I (at this point) need to know. This doesn’t make mine a position of faith, but rather one that is admittedly premised on not having sufficient information, and also on being aware of that lack of information. As long as there is some information rather than none, though, it’s a position that while agnostic still allows for one to choose sides in a non-dogmatic fashion. Our considered views are always contingent on the information we have access to, and we are often in a position to confess in advance that this information is inadequate for conviction to be reasonable. The example of climate change here is simply a foil for making the more general point that we have options besides that of dogmatic, uninformed zeal – especially in matters that are fraught with political or emotive tension – and the option of being an expert on the topic in question. We can say that we’re not sure, but despite this, we think it’s likely that some position is wrong or right. Doing so reminds us that it’s possible to change that contingent opinion when new evidence comes to light, and it sends a signal to others that it’s worth trying to change your mind on any given issue. 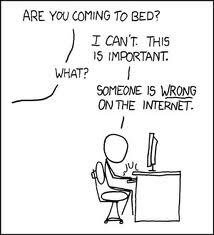 Sometimes we might even think it’s highly likely that some position is wrong or right, and this is when we should feel most motivated to defend it against opposing views. I suspect, though, that if we were to do an honest stock-take of our various points of view we might find that for most of them, the firm conviction we present is largely a fabrication. We might also find that this fabrication is in the service of ego, especially when we think that someone else is undermining our beliefs. To treat all beliefs as equally justified – or to forget that we mostly speak from a position of qualified agnosticism – is unlikely to be good for debate and for the possibility of discovering that we are wrong. And if we care about being right, or rather, care about believing things that are true rather than false, we shouldn’t forget that getting to the truth is often only possible through allowing ourselves to be uncertain – or even wrong.